The beginning of August signals to our family that school will be here very soon. Initially the flip of the calendar is disheartening. Yet, it reminds us that we must enjoy each and every day of these next few weeks. Our summer bucket list still has many things without a checkmark. However, this week we were able check one activity off the list when the whole family visited our community swimming pool. I do not like swimming all that much (Don't tell my children!). But, this community swimming pool has a sand area that is enormous -- and enormously fun! 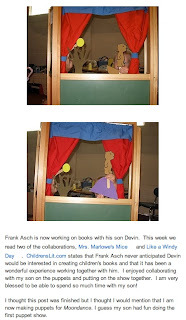 Earlier in the week we read Sand Cake by Frank Asch. 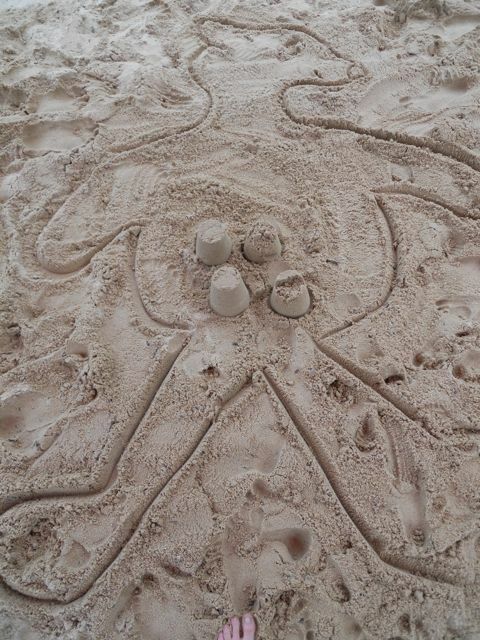 Papa Bear, Mama Bear, and Baby Bear are at the beach. Baby Bear needs an new activity -- lying on a beach towel with his mom and dad was not much fun anymore -- and asks his Papa, "If I make you a cake, will you eat it?" Papa Bear responds, " Sure, if you use flour, milk, and eggs." 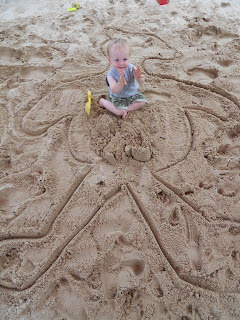 This baffles Baby Bear because he is at the beach and not in a kitchen! 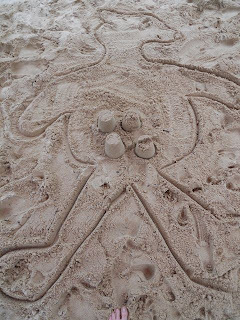 Papa Bear insists that it is easy and proceeds to draw a chicken in the sand using a stick which lays an egg. Then, he draws wheat to get flour, and a cow to get milk. He mixes it all together and cleverly bakes the cake in the sand. After a short swim the cake is ready when Papa Bear flips over the sand pail. Papa tries to throw a curveball at his son when he says, "Well, are you going to eat the nice cake I made for you?" 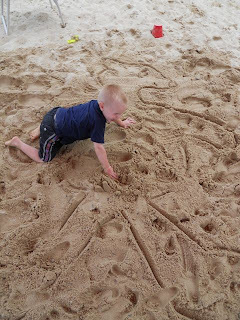 Baby Bear drew himself in the sand around the cake. The cake was then in his stomach! Our "Baby Bear" was really hungry and ate 4 cakes! And my youngest son! Yikes! For my oldest son, destroying the cakes was the best part! 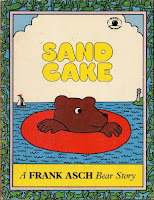 Sand Cake is currently out-of-print but Frank Asch narrates an animated version of the story on his website. 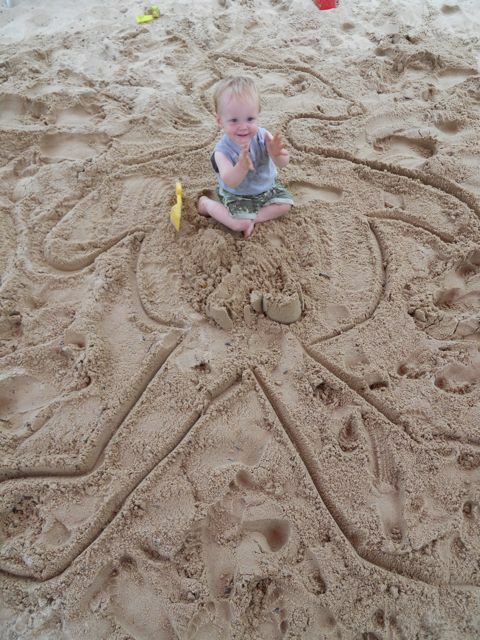 Maybe on your next trip to the beach or to the sandbox a Baby Bear will be eating a freshly baked sand cake! If you liked this Frank Asch Birthday Celebration - Check out last year's birthday celebration. Frank Asch has other videos of his books available on his YouTube Channel!